Sleek Makeup has just released their Eau La La Eyeliners, which are pencil eyeliners that promise vibrant, well-pigmented colour, and are touted to be long-lasting as well. I'm always on the lookout for a good and cheap eyeliner, so I was all over this like white on rice. Sign me up, already, will ya? 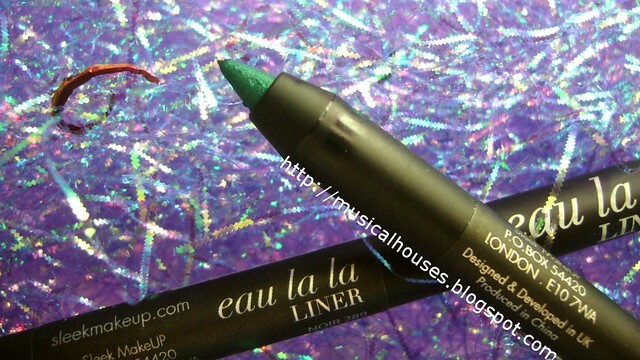 The Sleek Eau La La Eyeliners come with a really sleek (ha, ha) black casings, and look quite nice. These also have a cap that's really tight - when I opened the caps, I could literally hear a "pop" sound. I guess it's got some sort of airtight seal in the cap? That's usually a good thing, as higher end eyeliners tend to have more airtight caps, to prevent emollient ingredients from evaporating. This is a wooden pencil, so you'll have to sharpen it. Here's a close up shot of one of the eyeliners (Tonic), to give you a better idea of what the eyeliner nib looks like. As you might guess, Tonic is my favourite, since it has that gorgeous metallic, bejeweled quality to it. How pretty is that? All three eyeliners were very nicely pigmented, and felt smooth and creamy going on. 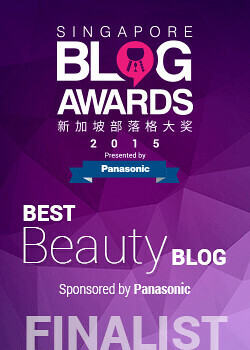 In terms of pigementation and texture, these actually rival high-end brands with really good eyeliners, such as Urban Decay and MUFE. So, we know they swatch well. But how do they hold up against other more famous brands when it comes to long-lasting-ness (if there's such a word)? Well, I knew that would be a question you guys would want to know, so I took the trouble to compare these with some of my other favourite eyeliners. 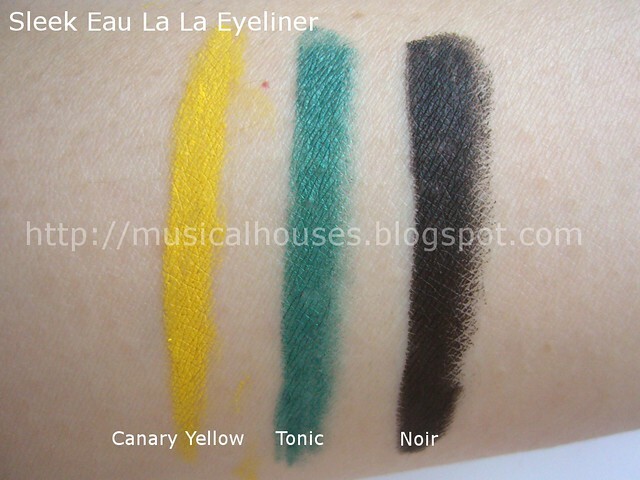 In the photo above, you see the Sleek Eau La La Eyeliners swatched. Next to them, there is Urban Decay's 24/7 Eyeliner in Stash, MUFE's Aqua Eyes Eyeliner in 3L, and GOSH Velvet Touch Eyeliner in Golden Moss. These are three of my favourite eyeliner brands, as I've found them to have the best colour range and quality, both in terms of pigmentation and lasting quality. In order to test these eyeliners out, I drew the lines on my arm, and let the eyeliners "set" for 5 minutes (although I know in real life wee don't always wait 5 minutes before rubbing our eyes and so on). I then subjected them to three tests: 1. Frantic rubbing with my finger test (you know, like when you rub your eyes really hard), 2. Putting them under a running tap (so like when you wear them to swim), and 3. Rubbing them frantically while putting them under a running tap (so if you rub your eyes underwater, I guess). Wow. I have to say, I'm impressed! 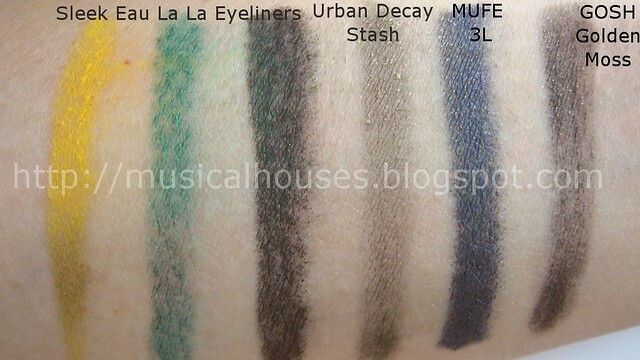 I'm already familiar with the Urban Decay, MUFE, and GOSH eyeliners, so I knew they would be good (that's why I tested the Sleek ones against these), but the Eau La La Eyeliners really performed just as well too! I think actually the MUFE one did the best, and some of the Sleek ones smudged a little more, but the difference is pretty marginal. I was expecting them to be all wiped off, but they're still there. I guess the only key differernce, thebn, would be how fast these set - so maybe I should repeat the experiment with a shorter waiting time, eh? 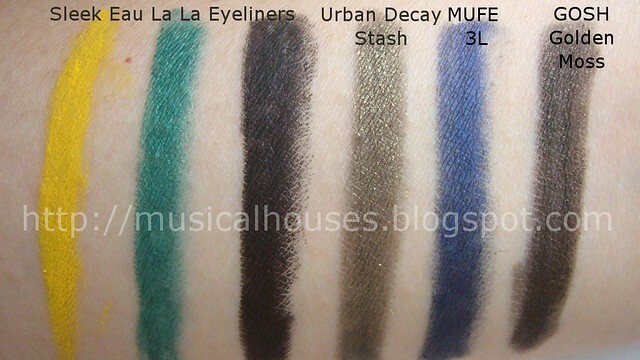 Anyway, I love these, and I'd definitely recommend them if you liked the Urban Decay, MUFE, or GOSH eyeliners, since the Sleek Eau La La Eyeliners are pretty similar. For me, I think I've just found another brand of eyeliners I love. 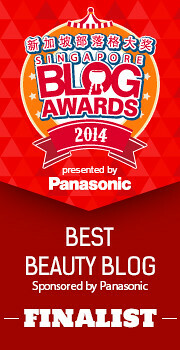 This is a great post and those eyeliners are really pigmented. The yellow color really pops. Have you tried the NYX glide-on pencils?? I really like the two I have. @Tammy: Unfortunately I haven't tried the NYX eyeliners yet! I really should though! They look GREAT and it's good to know they perform well, yay. Thank You for the post. 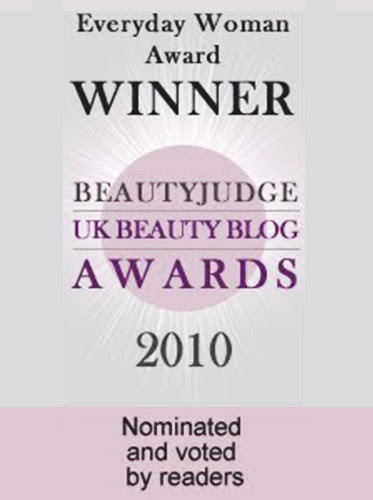 wow, fairly comparing with MUFE - that is wicked! 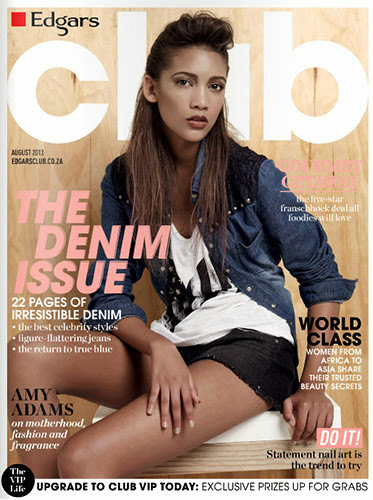 wanna check this out!!! love the testing you went through! thanks!